With a strong background in research Dr. Ahmad is a Board member of SPH Housing Association and sits on the Black and Minority Ethnic Review Forum (BMERF) of the Government Office for London (GOL) and is a Trustee of the Muslim think tank, the Centre for Muslim Affairs. With a PhD in Environmental Law from the School of Oriental and African Studies at London University, Dr. Husna Ahmad has held the role of Deputy Chief Executive of the Forum against Islamophobia and Racism and was a Principal Officer in the Royal Borough of Kensington and Chelsea. She sits on the Department for Works and Pensions' Ethnic Minority Advisory Group (EMAG) and is also on the Community Development Forum of the London Health Commission. Dr. Ahmad has been appointed co-chair of the National Council of Faiths and Beliefs in Further Education, a national independent inter-faith charity working with the learning and skills sector, faith and local communities and national and local faith/belief based groups. She was also a member of a Ministerial Working Group on Child Poverty in London in 2008. 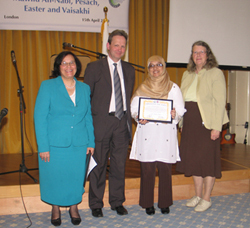 She is a national and international speaker on faith and regeneration, peace building and women's issues. Most recently she has spoken at a Peace Conference in Sri Lanka, been part of a delegation invited by the Kuwaiti government and a member of an FCO delegation to Iran. She is married with 6 children.